This rental was completely remodeled in November 2014. 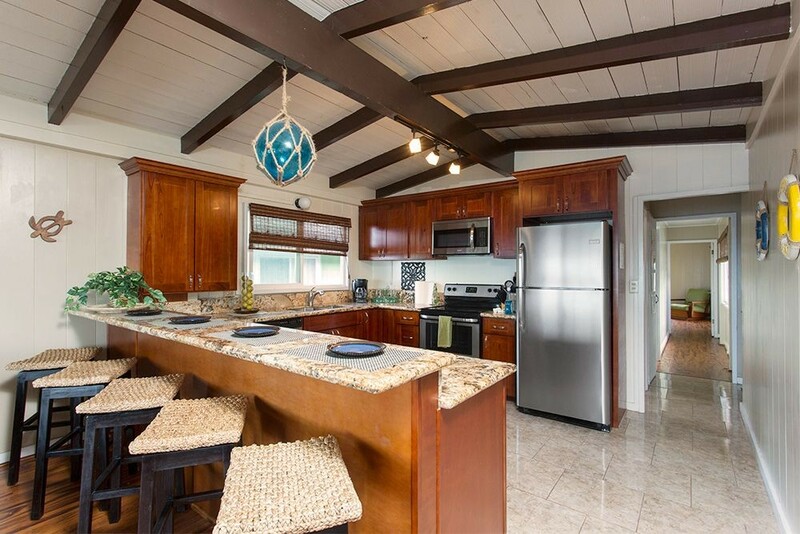 Ideally located on the North side of O`ahu, this rental has breathtaking mountain and ocean views - all yours to enjoy during your stay. The Turtle Bungalow is fully furnished and comprised of a large open living room with direct ocean views. Enjoy the large beautifully designed kitchen featuring granite countertops, stainless steel appliances, and all the amenities of a home kitchen. The kitchen is fully equipped with everything you need, including all appliances - refrigerator, range oven, dishwasher, microwave oven, rice maker, toaster, coffee maker, cook ware, prep ware, bake ware, dish towels, dishes, glasses, and utensils. Have a seat at the kitchen bar and enjoy a nice island cocktail as the sun goes down and as the waves roll in. The living room is spacious and furnished with a large ceiling fan, large sectional couch and ottoman, tall standing lamp, and an entertainment center, which includes a flat screen television (includes cable television). Air Conditioning in every room!!! This rental has 2 bedrooms and 1 bathroom. The bathroom is beautifully decorated and includes a tiled shower. Bedroom 1 has a Queen Bed and sleeps 2. Bedroom 2 has three Single Beds and sleeps 3. There is a Japanese style futon available for additional sleeping good for 2. All rooms are furnished with beautiful tropical decor and have air conditioning and ceiling fans for your comfort. Relax on the large deck out back and enjoy the cool breezes and gorgeous mountain views as you entertain family and friends. This area includes a designated picnic table and BBQ grill for your personal enjoyment or for entertaining other guests. This rental also has a washer and dryer for your convenience (shared with The Turtle Cabana guests). Boogie Boards, coolers, and beach mats located in a designated storage area for your use. Lounge chairs available for sunbathing on deck (please request at time of reservation that these be put out for you prior to your stay). The rental is part of a duplex, and shares a wall with the Turtle Cabana. Each unit has a separate entrance and is completely private. Our complimentary gift to you - a shampoo-conditioner-soap trio set. Come be our guest and enjoy island life at The Turtle Bungalow ... your very own tropical oasis!!! Very convenient and peaceful location. Honolulu is about an hour drive with a beautiful and scenic drive. Very clean! We really enjoyed our stay at the bungalow. It was super clean and comfortable. Clean, beautiful scenery, great location. Clean, beautiful scenery, great location. We loved our stay in this getaway. We could cook whatever meals we wanted and we were very close to grocery and fun outlets. We spent most of our time on the North Shore and love the people and facilities that were here. We made friends around the area and had a general overall good time. The only complaint we would have is that the air conditioning could not keep up with the heat. But if we kept the doors to our rooms closed we were able to sleep in comfort. We didn't come to stay in the house during the day. Conveniently located to BYUH (we were bringing a child), Polynesian Culture Center, and famous beaches. This is our 2nd family trip to the North Shore which we prefer. In excellent condition with everything needed. Boogie boards and cooler were much appreciated. Great to have washer/dryer too! The outdoor deck lighting didn't work and we were unable to use it at night. We may have just not known where the switch was, but the caretaker, who responded quickly, wasn't able to resolve. REALLY HOT when we arrived, but A/C cools well.